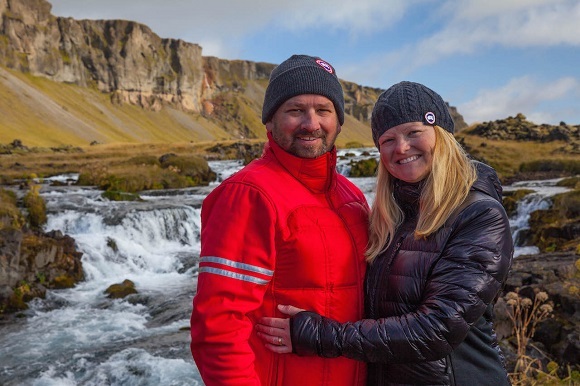 Award winning adventure couple Dave and Deb share their travel tips and stories on their blog The Planet D – and having traveled to over 100 countries, and visited every continent on earth, they’ve got some great ones! In their second guest post for liligo.com, they’re sharing 6 awesome extreme adventures for adrenaline junkies and couples alike! We love a great adventure. 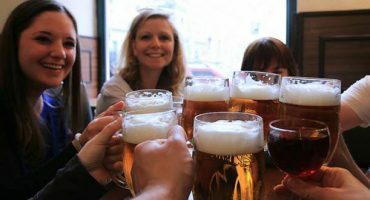 Our first article for liligo.com highlighted our favorite adventures that couples can do together but for this post, we wanted to bring it up a notch. Have you and your partner already travelled together a lot? Have you tried some new hobbies together and are ready to ramp up the excitement? 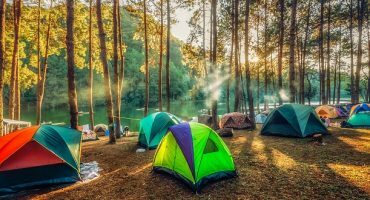 If you want to experience something epic with the one you love, try one of these awesome adventures to add an extra spark into your relationship. We tried them and it definitely made our hearts go pitter-patter! It was touted as the world’s longest cycling race. 12,000 km from Cairo, Egypt to Cape Town South Africa. We pedaled our bikes through 10 countries from the deep sands of the Nubian Desert in the Sudan, through the mountains of Ethiopia and the lush jungles of Tanzania and Zambia. It was an adventure of a lifetime challenging every part of our bodies for 120 days. We fell in love with Africa during that trip. It pushed us beyond our limits and brought us closer together as we relied on each other for strength and stamina to keep on riding day after day. 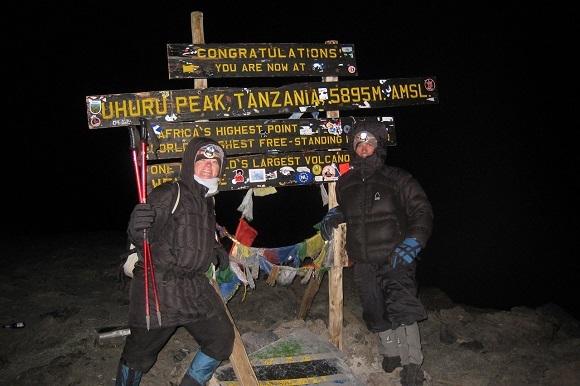 Staying in the continent of Africa, another one of our greatest adventures was climbing Mount Kilimanjaro. It was a dream of ours to climb Kili and it didn’t disappoint. What makes this climb so unique is that it starts in a hot and humid rainforest and climbs steadily through different terrains until it reaches the glacier at the summit. We took the Machame Route, known as the Whiskey Route. This adds an extra day onto the trip, but improves your chances of making it to the top. 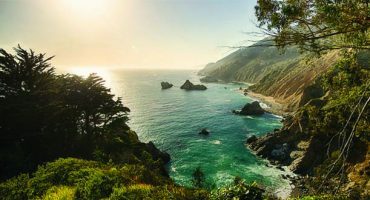 It’s a tougher climb than the more popular Coca Cola route, but the extra day gives your body more time to acclimatize to altitude and it offers better views and more variety in terrain. This route took us through jungle trails, moorlands shrouded in clouds and daring scrambles up sheer rock faces. On the sixth day of climbing, we made a summit push at midnight for a six-hour trek in sub zero temperatures to the top at 5895 metres. It was one of the most emotional experiences we ever had together as a couple. After climbing Mount Kilimanjaro, we were hooked on high altitude. Having read every book we could on Everest, we were determined to make it to Nepal one day. It was while traveling through India that we booked our flight to Kathmandu and lived our dream. Hiring a local guide, we flew with our new friend Dipendra of Simrik Real Nepal Trekking to Lukla where our two-week trek began. Everest is different from Kilimanjaro by the fact that you stay in teahouses along the trail rather than camping. Everest base camp isn’t a technical climb, but it is an extended period of hiking above 4000 metres. Our trip took us through villages with awe-inspiring views of the Himalayas. Laying eyes on the world’s highest mountain was an exhilarating experience. 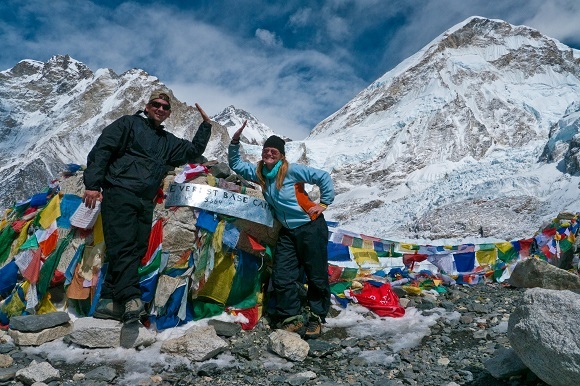 We were following the footsteps of greats like Sir Edmund Hillary and Tenzing Norgay Sherpa. It was humbling to see the beauty around us. Standing where so many great people stood before us is something we’ll never forget. We love long overland trips. 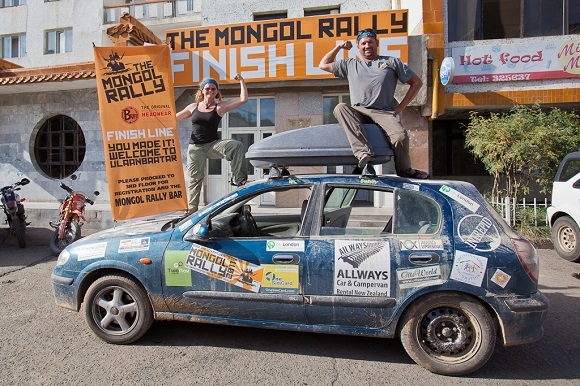 The Mongol Rally took us one third of the way around the world through 15 different countries. Had we known how daunting a task the rally was, we probably wouldn’t have signed up for it in the first place. But ignorance is bliss and we went into the rally with rose coloured glasses managing to secure a car in England to drive overland through places like Siberia, Kazakhstan, Ukraine and Romania. Our little car made it all the way and we managed to donate it at the finish line and raise money for orphaned and abandoned children in Mongolia. Being stuck in a tiny car together for six weeks makes you learn quickly if you will make it through life together. If you can survive the Mongol Rally as a couple, you can survive anything. Whenever Dave and I do something epic and challenging together, we come out on the other side closer and stronger. We suffer and complain during an adventure like trekking 100km through northern Canada in the dead of winter but when we are finished, we find out just how deep we can dig for strength. The Lure of the North in Ontario Canada is a trek that took us across a stark winter landscape where we boarded a freight train for 12 hours to be dropped off in the middle of the wilderness. For the next 10 days we hiked over frozen rivers and lakes, dug our way through thick brush and camped in a traditional prospectors tent. 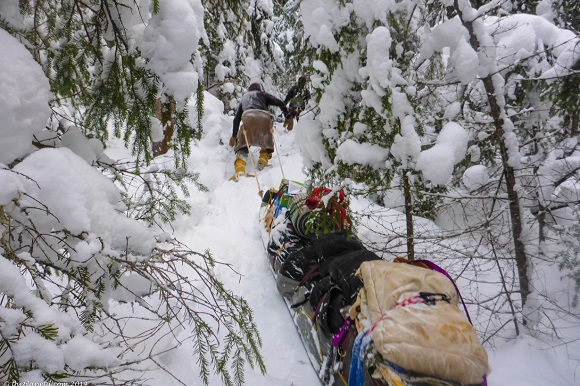 We had to cut down trees for firewood, hack off spruce boughs to sleep on and chip through a metre of ice to use for drinking water and cooking. All of this was done in minus 30-degree weather. It was the toughest adventure we’ve ever done in our lives but at the end, we were proud of one another and as usual, this adventure made not only us stronger, but our relationship stronger as well. Doing an adventure together is a great thing, but learning something new together is even better. I have to admit, I have a fear of the water. Dave loves water, but even he had trepidations about turning upside down in a tiny kayak in raging rapids. So what does one do when they have fear? They face it together head on. 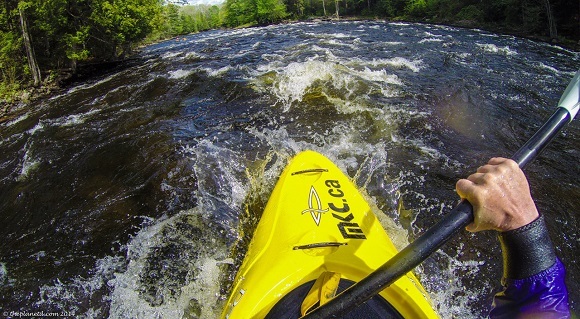 We spent a week at the Madawaska Kanu Centre in Ontario, Canada learning how to read and run whitewater. By the end of the week we conquered those rapids and learned how to master the roll. Going into the week, we were both afraid, but by the end, we were invigorated, energized and ready to take on the world together. We love learning together. If we did it apart, one of us would be left behind. There is nothing greater than conquering your fears as a couple, and encouraging one another. 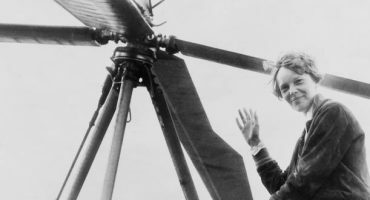 The one thing all of these epic adventures have in common was that they inspired us both. Each of us saw strength in one another that we hadn’t seen before. We witnessed determination and we both saw each other grow and evolve. Adventure can do that. No matter how much you’ve done or how old you are, you will always learn something about yourself when you push beyond your limits.